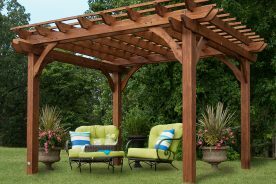 Imagine sitting around with friends and family under the stars and doing nothing more than relaxing. Many families spend their summer doing exactly this, only to be forced indoors when the weather starts to cool. With the help of an outdoor fireplace, a family can extend the time they have to do this. 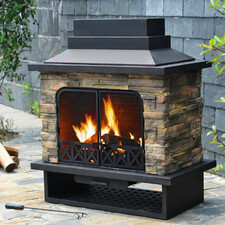 The outdoor fireplace is a great way to remain cozy even when the temperature starts to drop. When choosing an outdoor fireplace, many options need to be taken into consideration. First and foremost, a person must determine which type of fireplace they wish to have. Available options include a chiminea, a fire pit and a fire bowl. It’s typically a matter of personal preference when it comes to deciding which style to obtain. Next, the various features need to be chosen. The fuel source is one major consideration, but not the only one. For example, one model may be converted from a fire pit to a gas grill, while another allows the user to maximize their outdoor living space. This includes models which serve multiple purposes, such as those which convert from a fire pit to a table when the family wishes to eat outdoors. 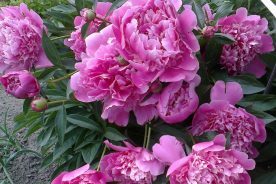 Again, the features tend to be a matter of personal preference, and following is information that may be of help during the buying process. 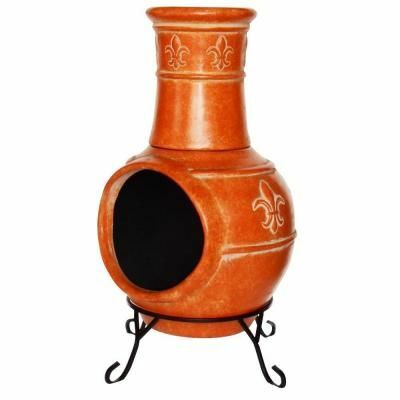 A chiminea remains a popular type of outdoor fireplace. Featuring a top opening for the smoke to exit and a large front opening to draw air in, the fireplace ensures sparks remain inside, rather than exiting the chiminea where they can harm users. Most fireplaces of this type are made using porcelain, ceramic or clay. An outdoor fireplace is similar to one that is found in the home, but numerous factors need to be considered before constructing a unit of this type. Will one open end be needed or two? This depends on the average number of people gathering around the fireplace. In addition, are extra features needed, such as a fireplace capable of cooking a barbecue or pizza? The fireplace also should blend in with other architectural features of the home, and size must be considered to ensure it doesn’t overwhelm the dwelling. Finally, a fuel source must be selected and a design chosen. Some find the work involved to be more than they are willing to take on, yet others find they love the look of the custom structure. It’s all a matter of what each person is comfortable with. Fire bowls typically consist of metal with a finish to enhance the look of the device. Finish options include stainless steel, cast iron and bronze. 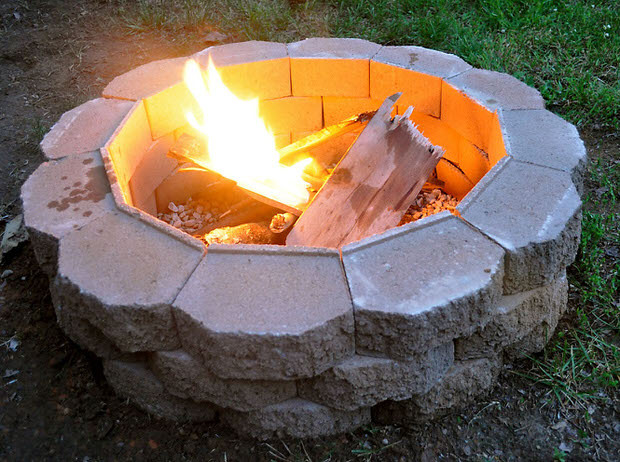 Regardless of which metal and finish are selected, most fire bowls come in the shape of a bowl, as this construction allows the wood to burn slowly and heat to radiate around the area. Those looking for portability will appreciate this option, as it can be taken wherever the owner goes, and the sides remain open to ensure easy access to the wood. 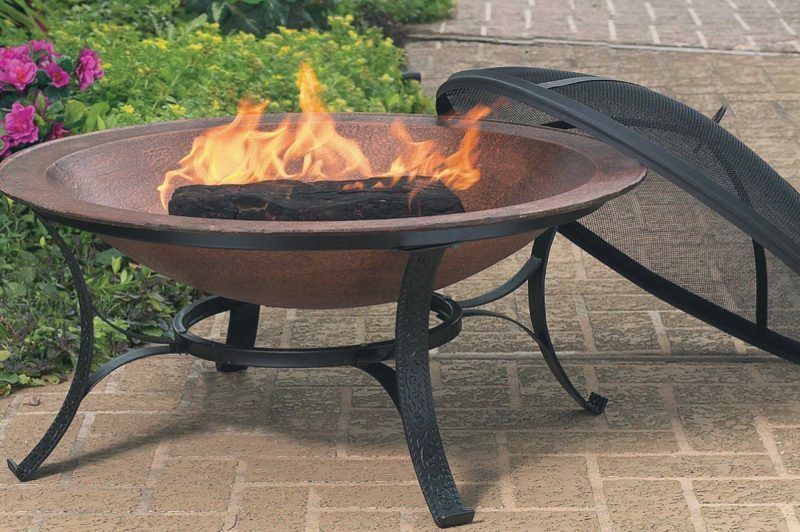 The fire bowl sits on either a metal stand or table or it may be installed on a cement or stone surface at ground level. If choosing this type of device, it’s best to look for one that comes with a steel grate and heavy-mesh guard against sparks. Fire pits come in many versions. Some are nothing more than a hole dug in the ground while camping, others are very elaborate structures made of brick, stone or metal. All, however, are designed in a way that they will contain a fire to ensure it does not spread. 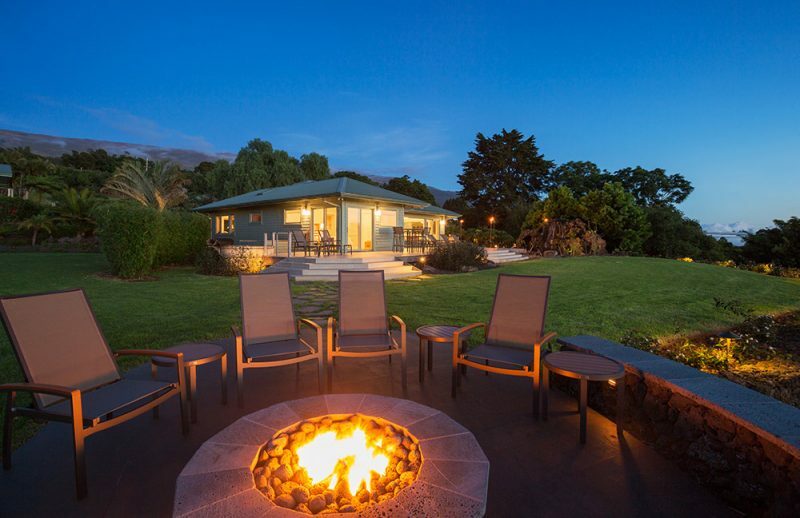 Most commercially available fire pits are made of metal, pre cast concrete or a mixture of stone and metal table, and most make use of propane, bio ethanol or natural gas. Wood burning fire pits are becoming less common due to concerns about air particulate emissions and as a result of fire bans. In-ground fire pits remain the first choice of many, as they are simple to construct and can be used anywhere. Two small holes need to be created in the ground, one for holding the firewood and the other to ensure a draft of air to feed the fire. Small branches and twigs are stuffed into the first hole along with combustible material and the pile is set on fire. A stream of fresh air is then created in the air hole, and this helps to ensure the fire will burn strongly, as a result of complete combustion. 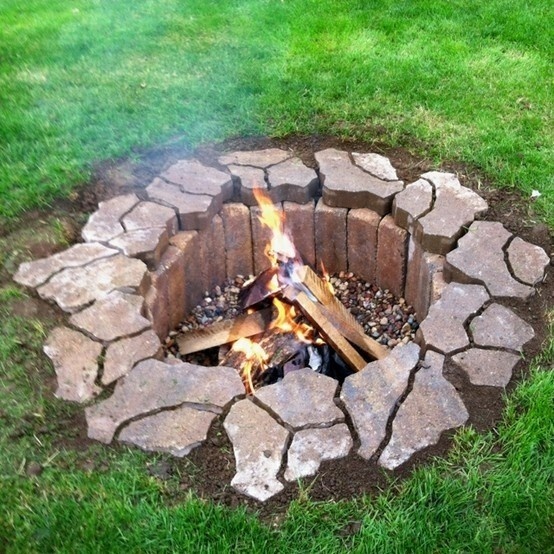 Little or no smoke is produced with this type of fire pit, and individuals find the fire can be easily lit even in strong winds. 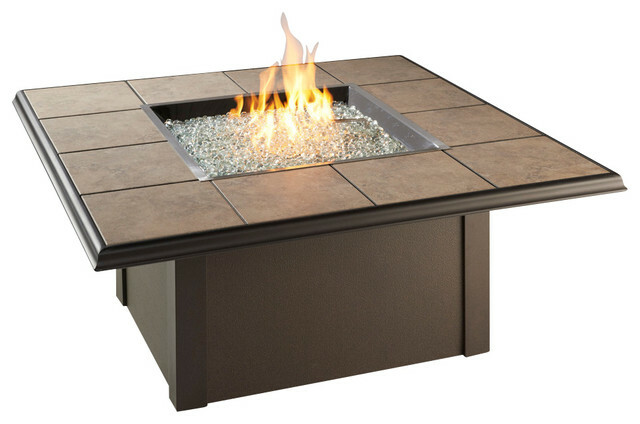 Numerous people now opt for a propane fire pit table thanks to their ease of use. As they always have a constant fuel source, they can be used at any time and won’t run out. Their ability to maintain a flame that is both authentic and steady over a period of hours is a major benefit, and they come in a wide variety of materials to meet the needs of all. They double as a table when not in use, allowing consumers to get more for their money when they select this option. Where Should My Fireplace Go? The first thing to consider when selecting an outdoor fireplace is where it will be situated. Determine the available space for the unit, as this will help to greatly reduce the available choices. In addition to room for the fireplace, potential buyers need to take into account room for movement around the unit and seating for those who will be enjoying the warmth. Many families choose to install their fireplace in the back yard and build an entire area of the yard around this landscaping feature. 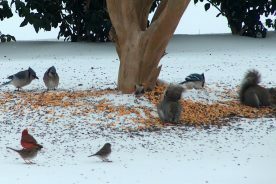 Others choose to place the unit in the front yard, and this may help to encourage neighbors to stop by and visit. A deck or patio is another location to consider when deciding where the unit will be placed, and purchasing a portable unit allows one to move the fireplace to different locations, depending on their needs at any given time. Safety must be a priority when making this determination, thus the safety tips included below should be reviewed during the decision making process and regularly after the purchase. Next, it’s time to determine the style of fireplace, and there are many different versions available, as seen above. For many, this decision revolves around the desired features, but others make their selection based solely on the style of the unit. Once this has been determined, it’s time to move on to the fuel source, to ensure a unit is available that accommodates the desired fuel, and the features that are needed. When these decisions have been made, it’s time to shop for the fireplace. Maintaining an outdoor fireplace isn’t difficult. Ashes need to be removed regularly, but this can usually be done with nothing more than a broom and shovel. When cleaning the fireplace, make sure to inspect it for any worn or failing parts, as this will help to prevent any accidents or injuries. Furthermore, ensure the fireplace is set on a hard, level surface and includes a fire screen. The screen protects young children and pets from flames and smoke. Never make use of this type of fireplace indoors, near anything that is flammable or on a balcony, and keep the device a minimum of 15 feet from vegetation, as this will help to avoid a brush fire. Be sure to learn about outdoor fire codes before purchasing a unit of this type, and keep a fire extinguisher nearby whenever the outdoor fireplace is in use. In the event something does go wrong, this device will be of great help in controlling the situation. Start some new traditions for your family that involve the use of the fireplace. For example, on the last day of school, make hot dogs and s’mores using the fire. 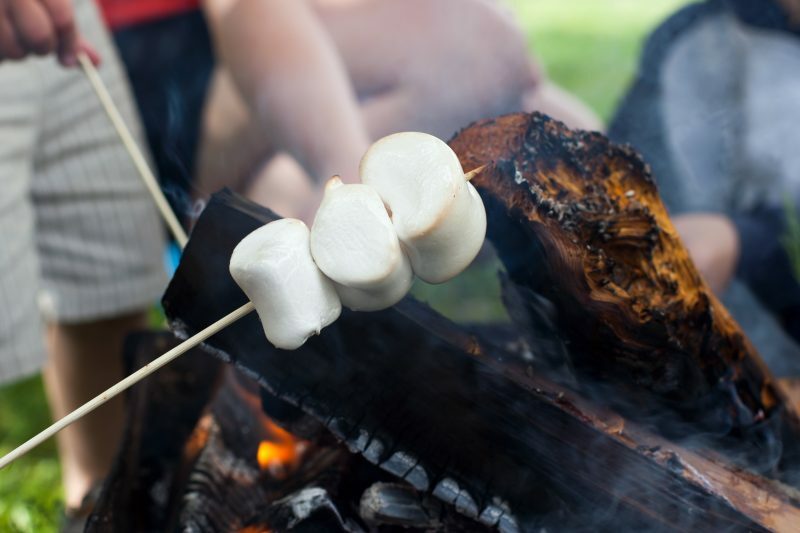 Celebrate Independence Day by seeing if special fuel can be used to turn the colors of the fire red, white and blue, or host an annual summer barbecue with food prepared in the fireplace. These are only a few ideas of traditions a family may wish to incorporate into the year, and there are numerous others. Most families find they come up with some of their own too. When selecting an outdoor fireplace, keep in mind this unit is designed to be a gathering place, one where friends and family will spend countless hours enjoying each other’s company. It should reflect the personality of the owner and meet the objectives of him or her also. Anything less and the family won’t get as much enjoyment out of the device. Whether a portable unit is chosen or a permanent outdoor fireplace is installed, safety needs to be the top priority. Keep this in mind at all times. By doing so, you are sure to get the maximum return on your investment, as you’ll find friends and family want to spend more time together enjoying the outdoor fireplace and all who gather around it.